Place of Birth: Joliet, Illinois, U.S.
Nick Offerman is an American actor, comedian, writer, producer, musician, humorist, and carpenter. 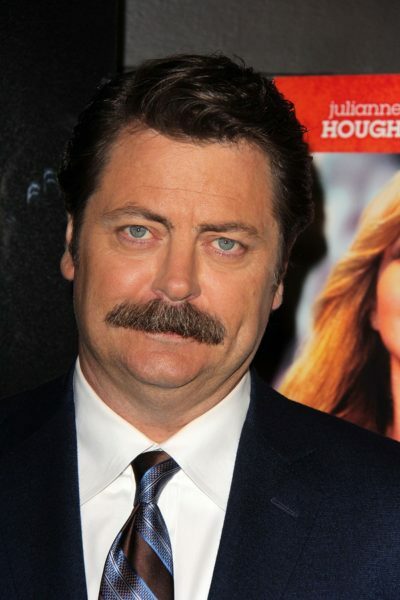 He is the son of Catherine Ann (Roberts), a nurse, and Frederic Dames Offerman, a teacher. Nick is married to actress Megan Mullally. Nick’s father is of German (including Swiss-German) descent. Nick’s mother is of Irish, English, German, Swiss-German, as well as distant Welsh, and remote French, Scottish, and Jersey (Channel Islander), ancestry. Nick’s paternal grandfather was Raymond Eugene Offerman (the son of Nicholas/Nick M. Offermann and Matilda F. Schweizer). Raymond was born in Illinois. Nick’s great-grandfather Nicholas was born in Illinois, the son of German parents, Franz Offermann and Susannah/Susanna Korst. Matilda was born in Illinois, to Swiss-German parents, Joseph Casper Schweizer and Barbara Ernst. Nick’s paternal grandmother was Marilynn Olivia Dames (the daughter of Fredric/Fred Cramer Dames and Louise Juliet Wilhelmi). Marilynn was born in Illinois. Fredric was the son of Joseph Dames and Margaretha/Margaret Cramer/Kraemer, who were born in Illinois, both of them to German parents. Louise was the daughter of John Peter Wilhelmi and Mary Louise Boos, who were also both born in Illinois, to German parents. Nick’s maternal grandfather was Michael Donald Roberts (the son of William Dean Roberts and Carrie Alta Orvelene Knupp). Michael was born in Illinois. William was the son of Samuel Johnson Roberts and Sarah Ann Prater. Carrie was the daughter of Michael Lafayette Knupp and Lenna Mae Thompson. Nick’s maternal grandmother was Eloise Catherine Loucks (the daughter of Harry Milton Loucks and Hazel Ada Smith). Eloise was born in Illinois. Harry was the son of Milton Scott Loucks and Catherine Bell Barr. Hazel was the daughter of James Charles Smith, whose parents were Irish, and of Mary/May J. Kehoe, who was Irish. Hazel was the daughter of James Charles Smith and Mary J. Kehoe, who was Irish. —> Hazel was the daughter of James Charles Smith, whose parents were Irish, and Mary J. Kehoe, who was Irish.